The walk is divided into two parts: The Northern Rampart’s Walk ascends at Jaffa Gate and descends at New Gate, Herod’s Gate or Lion’s Gate. 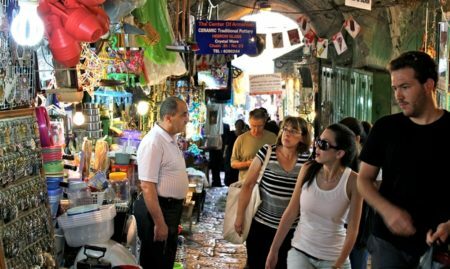 The Southern Ramparts Walk ascends at Jaffa Gate and descends at Zion Gate or Dung Gate. There is a direct exit from the northern Ramparts Walk to the Roman Plaza and/or Zedekiah’s Cave to streamline the touring and sightseeing experience. It’s a nice walk if you look outside the old city but as soon as you look on the inside you are just going to see trash, abandoned stuff on the roofs, garbage etcetc. There’s no maintenance at all. The three of us definitely wanted to do this walk and we did it. It was worthwhile but the total experience was not as great as we thought it would be. It was good but you could see nothing of the inner part of the Old City. We did both parts of the walk. Paying for the tickets was just inside the Jaffa Gate and close to the tourist office. There are two parts and each is on an opposite side of the Jaffa Gate. If you go up on the opposite side of the Jaffa Gate from the ticket office then you head past the Citadel and to the Zion Gate and beyond. Then you backtrack and then go up on the same side as the ticket office and you then go past the New Gate and Damascus Gate. It seemed to be blocked past Herod's Gate. There are nice views on what is outside the Old City. However, except for the Citadel and directly above the other gates you don't have great views into much of the Old City. Much of what you might want to see is not close enough to the walls to see. Despite all this we were glad we did it. To walk on top of much of the walls that surround the Old City of Jerusalem was still exciting. There are places where you need to step up or down some rather high steps. Anyone with mobility issues should probably think twice about attempting the walk. The self-guided tour materials aren't great, but the views you get from the Ramparts walk is cool to see. If you have time, it's worth it and not expensive to do.